Rule No. 1: Do NOT enable FTP. Unsecured FTP is a can of worms. Use SFTP (Secure FTP over an SSH tunnel). What you will need: a Linux instance (preferably with SELinux enabled). In this tutorial, NGINX is the web server, php-fpm is the PHP interpreter. Each website (or a set of related websites) should be owned by its own Linux user (for information on creating Unix/Linux users, see this post). The user needs shell access and a home directory somewhere outside of the web server’s document root (one good place is /home/username). The website owner also needs to own the php-fpm pool that corresponds to that website (user = websiteowner1 in the configuration file which creates the pool, see this post for more details). Once this is done, it’s time to allow access to external software tools which support SFTP (such as Adobe Dreamweaver CC, FileZilla and others). and you will be able to sudo su after successful authentication. (By default, all members of the wheel group on RHEL/CentOS/Fedora can assume sudo privileges). Next, verify the ssh setup of your remote machine. Now it’s time to set up access for your site owners. On the client machine from which you wish a user to connects, create a key pair. This has to be done locally on the computer that is going to initiate a connection; this is the only way to ensure that the private key does not traverse a network. 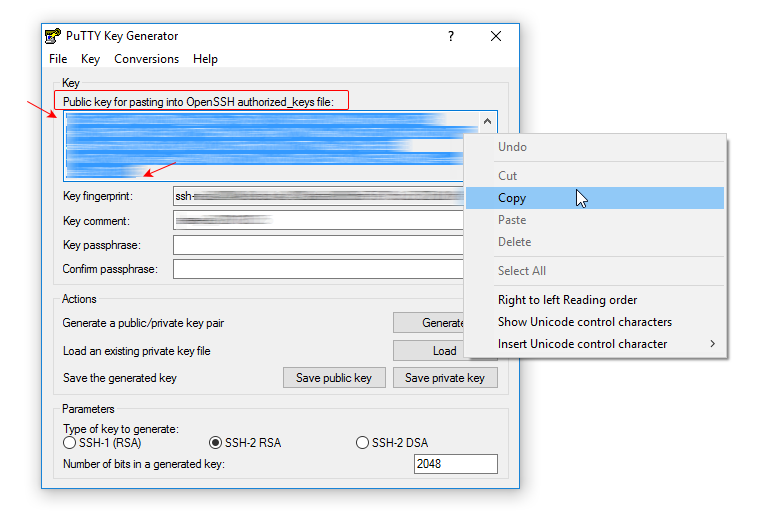 On a Windows desktop, you can create OpenSSH keys using PuTTYgen as described in this post. A key can be protected by a passphrase. The passphrase, however, is non-recoverable. Should it get lost, your user will need new keys and you will have to repeat the setup. Unless you set a passphrase, however, anyone in the possession of the private key can gain access to the server. The balance between security and usability is a question of your priorities. On systems which represent high-value targets, a passphrase adds tangible value to the setup. This is also the case when the private key resides on a mobile device which can easily be lost or stolen. (In the above example, id_rsa is the name of your private key and ~/.ssh is the containing directory). drwx------. user1 user1 unconfined_u:object_r:ssh_home_t:s0 . drwx------. user1 user1 unconfined_u:object_r:user_home_dir_t:s0 ..
Only the public key is transferred to the server; the private key remains on the machine where it was generated. Here is how to set up Dreamweaver for access to the Linux server with the keys just created.